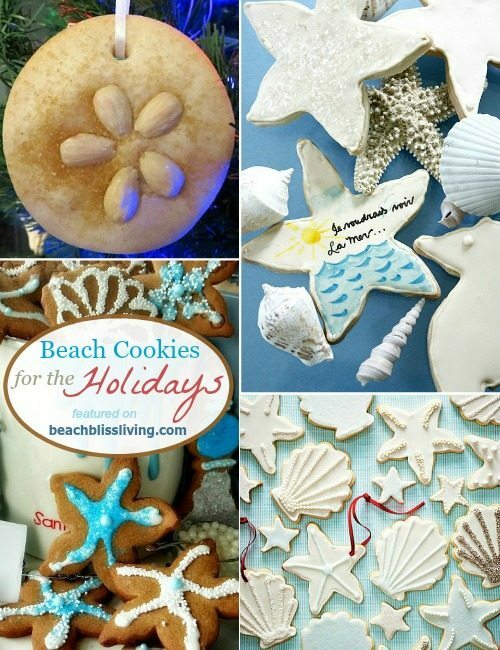 Beach cookies, as well as cookie cutters, are festive treats and decorations to have around for the Holidays and Christmas. Put them in a glass jar, hang them up, or hand them out as mini gifts. 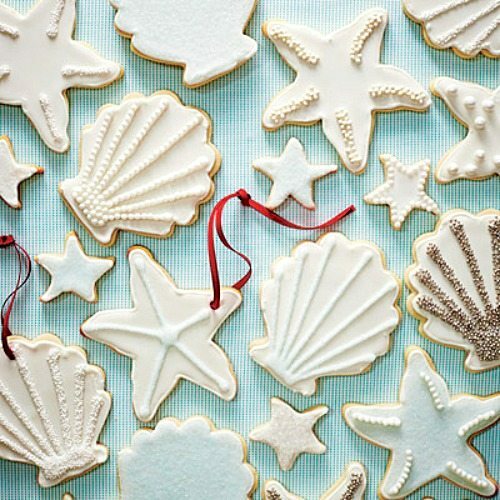 Beach Cookies made with Starfish and Shell shaped Cookie Cutters (about 3 1/2″ in diameter and 1″ deep), and festive white royal Icing. To make your beach cookies into Christmas Tree Decorations, carefully make a hole in the top. For more variety, get a Set with 7 Different Cookie Cutters. Monochromatic white cookies are not only elegant and festive, but they’re a time saver too, since you don’t have to mix a bunch of different colors. Made by Lila Loa. 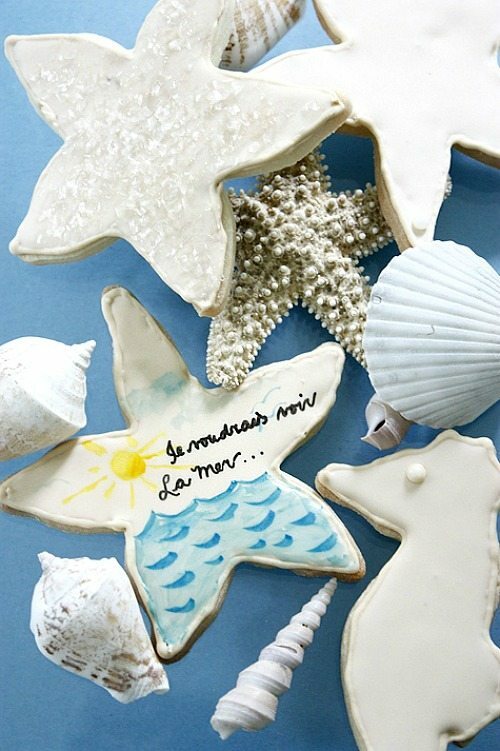 A painted starfish cookie idea from La Table de Nana. Even just beach cookie cutters are fun. 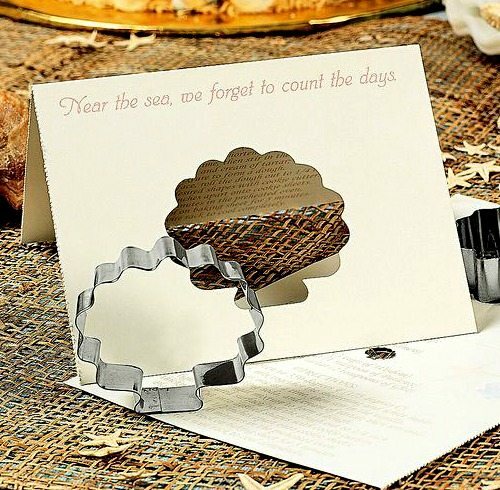 This is an idea for a simple cookie cutter gift with card from Oriental Trading. No longer available to purchase, but easy enough to make. The card includes a cookie recipe inside. Another use for cute Beach Cookie Cutters -string a bunch of them up on pretty ribbons for the Christmas tree, or tack them to the window casing in your kitchen! Sand dollar cookies are the easiest cookies to make. No cookie cutters needed. 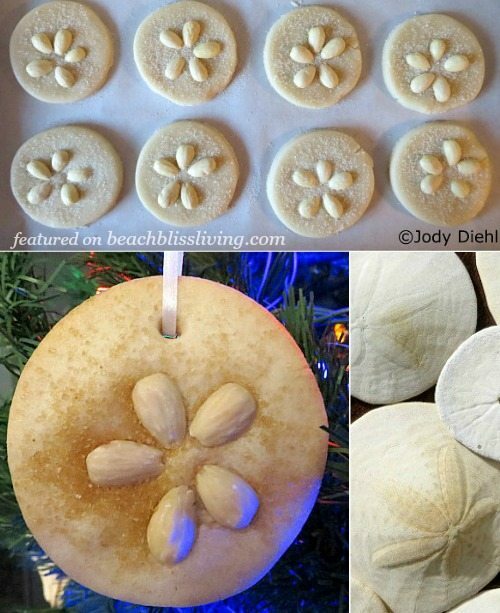 These festive Sand Dollar Cookie Ornaments were cut out with a Mason jar lid. 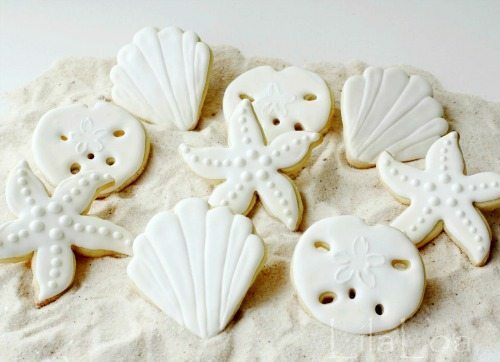 Find more recipes for sand dollar cookies posted here. 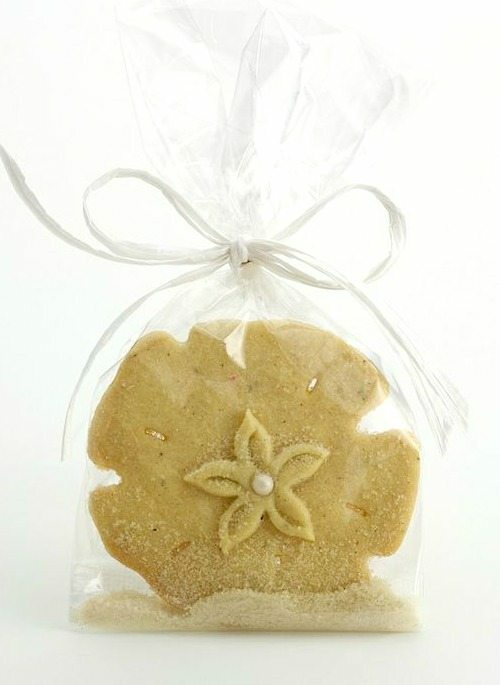 A single decorated beach cookie makes for a lovely little gift for a hostess or your guests. Sold by Plum Island Cookie Company. 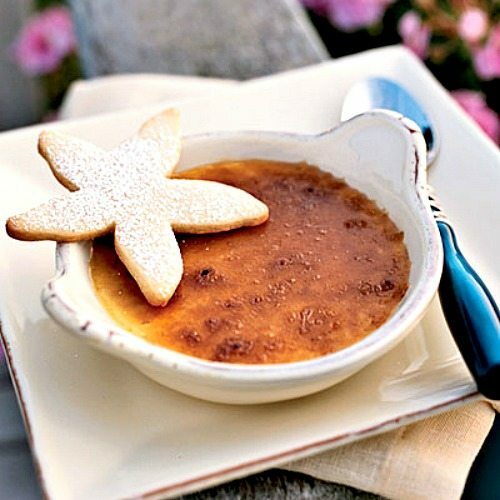 Or try this simple Starfish Butter Cookie Recipe. 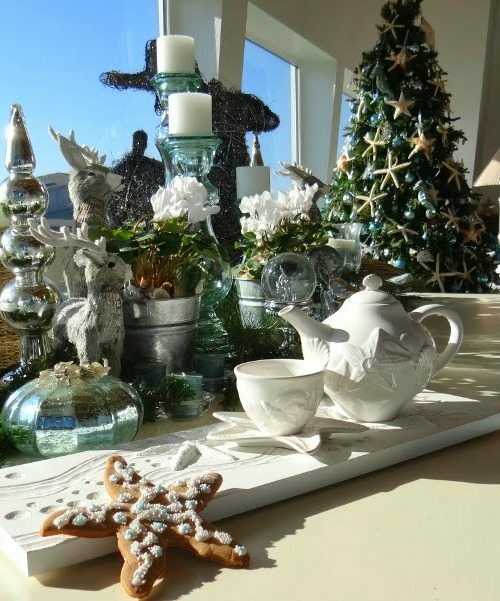 For that festive white look, sprinkle cookies with powdered sugar. Christmas cookie inspiration from a A Quiet Life. 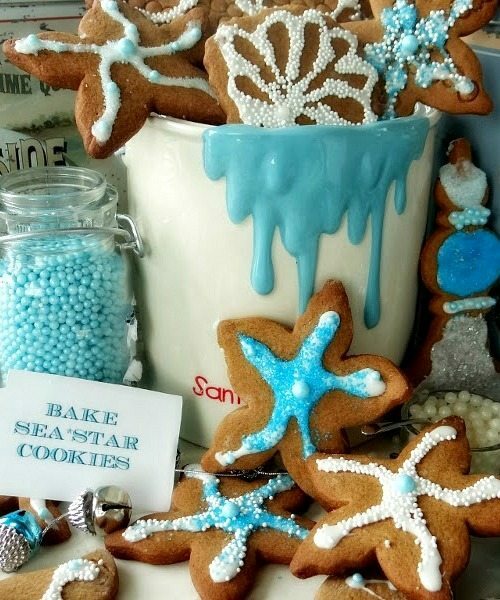 For these sea star cookies, follow a simple Gingerbread Cookie Recipe, then add sparkle with icing and tiny sugar beads as you please. To a sweet Holiday and Christmas season with beach cookies! Or how about Beach Candy? Where is the adorable teacup and saucer from? Would love to carry in my store.